I packed up my 8-year-old son and drove 35 minutes into downtown Omaha to walk the brick streets of the Omaha Farmers Market. He is the early bird in our house, and I can always count on him for a second set of hands when it comes to Saturday mornings at the Market. It was opening weekend for the market and a busy one for our family. We celebrated my husband’s birthday the night before, and on Sunday our son participated in his first communion. We had food to buy, cakes to bake, rehearsals and soccer games to attend, and a garden to help a neighboring family plant. In short, it was a typical weekend in the life of a family. 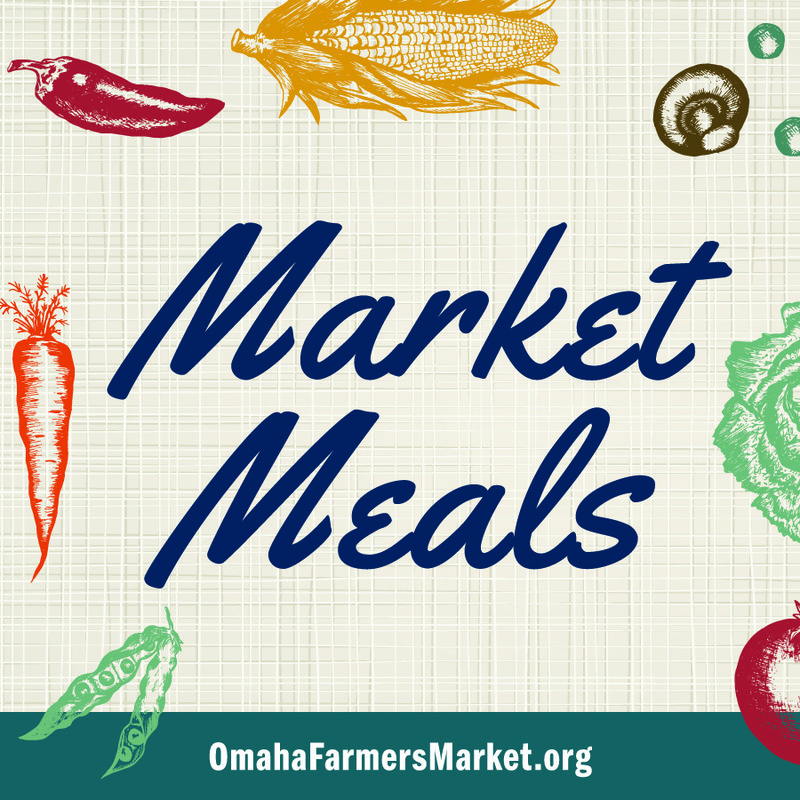 This hectic schedule is one I’m trying to keep in mind as I partner with the Omaha Farmer’s Market to develop in-season recipes for you to try at home and share with your friends and family throughout the spring, summer and fall. 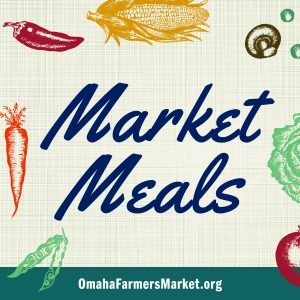 I know your life is busy, which is why the recipes I develop for Omaha Market Meals will be family friendly, simple, and still leave you with plenty of time to enjoy the people in your life. I can’t promise you will suddenly learn to love kale, or that you will never spend twenty minutes chopping vegetables, but I can promise you the recipes will work and taste great. I hope you will consider time invested in the makers and growers at the Omaha Farmer’s Market time well spent, and I hope you participate in the process. Follow the Omaha Farmer’s Market on Instagram and me @scaldedmilk_. Send me an email at miller.summer@gmail.com to ask me anything. Is there a vegetable or a cut of meat you’ve always wanted to try, but you weren’t sure how to use it? If I don’t know the answer, I will find out for you. In the meantime, as we look forward to celebrating the mothers in our lives on Sunday, I wanted to share a simple six ingredient recipe that can be made up to 5 hours ahead of time and kept in the fridge until needed. It’s a perfect Mother’s Day dessert that’s so easy even a person who hates to cook can make it. My favorite heavy cream is Burbach’s Dairy. It’s the one sold in the glass bottle, and it’s worth every penny. This recipe makes enough rhubarb purée to serve 12 desserts. You will just need to triple the amount of whipped cream you make. You can also keep the party small, and save the extra purée to eat all week on scones, or it stir into oatmeal or yogurt, use it as a sauce for ice cream or angel food cake. It will store in your fridge for a month. If you like your rhubarb on the tart side use ¾ cup of sugar, if you have a sweet tooth, use the full cup. Make the purée a couple of hours before you need to serve it, so it has ample time to cool before folding it into the whipped cream. Toss the rhubarb, sugar, orange juice and vanilla bean paste into a medium sauce pan and set over medium heat, stirring occasionally until the rhubarb begins to fall apart. This should take about 20 minutes. Use an immersion blender to purée the rhubarb. The purée is finished when it’s thick enough coat the back of a spoon and maintain a line drawn through it. If it doesn’t hold the line let it simmer for a bit longer. Continue to stir occasionally. Set a fine mesh strainer over a bowl and push the purée through strainer or sieve. * Transfer the bowl to the fridge to cool completely. It needs to be cold before folding it into the whipped cream. You should have a about 4 cups of sauce. Pour the cream into a large bowl. Whisk until soft peaks form. Add the sugar and extract. Whisk until stiff peaks form. 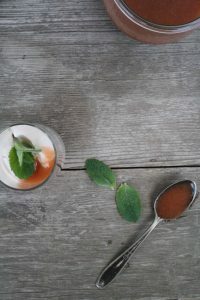 Gently fold ½ cup of the cold rhubarb purée into the whipped cream until it’s well incorporated. 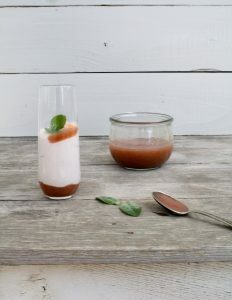 To assemble the dessert, place 1 tablespoon of rhubarb purée in the bottom of a clear glass. I’ve used everything from small ball jars to champagne flutes. Top with ½ cup whipped cream mixture. Spoon a little more purée on top. Garnish with a sprig of mint, and serve. You can assemble these desserts 5 hours before you need to serve them. Just keep them in the fridge. *The most time-consuming part of this dessert is pushing the purée through the fine mesh sieve. If you want perfection then spend the time doing it. If you don’t have a sieve or you are pressed for time you can cut out that step. The purée is still delicious, and the dessert will still come together.